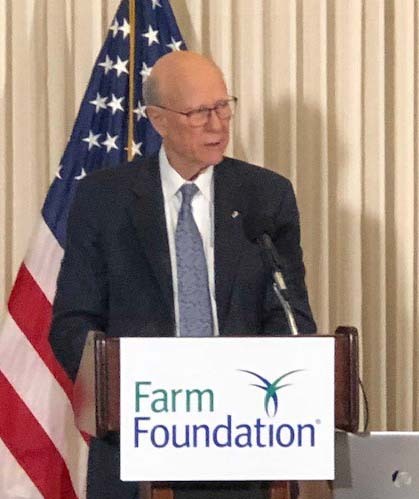 At the Feb. 5, 2018, Farm Foundation Forum, Sen. Pat Roberts (R-KS) and U.S. Department of Agriculture Deputy Secretary Steve Censky opened the session with comments on the implementation of the Agricultural Improvement Act of 2018. Listen to audio of the two-hour Forum: The Realities of Implementing the 2018 Farm Bill. As Chairman of the Senate Committee on Agriculture, Nutrition and Forestry, Roberts had a key role in passage of this Farm Bill, which was signed into law in December 2018, just days before a 35-day partial shutdown of the federal government began. Deputy Secretary Censky spoke to the Department’s role and efforts to move forward with implementation of this important legislation. 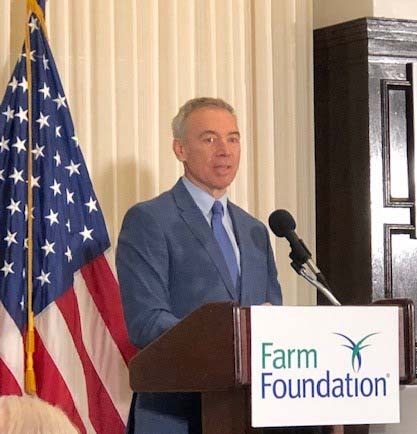 Following the comments by Roberts and Censky, there was a discussion of the challenges and opportunities of implementing the new Farm Bill. Panelists were: Barry Flinchbaugh, Ph.D., Professor Emeritus of Agricultural Economics at Kansas State University; Tara Smith, Vice President of Federal Affairs with Michael Torrey Associates; and Alan Bjerga, Senior Vice President of Communications with the National Milk Producers Federation. Farm Foundation organizes these public forums to engage all stakeholders in informed dialogue on food, agricultural and rural policies. Participants examine current policies, explore and analyze alternative policy options, and give voice to new proposals.